Microsoft developed XP Mode to allow you to run software that is compatible with Windows XP but not compatible with Windows 7. Unfortunately, running a Virtual Machine means you have to maintain two computers, your physical computer and the Virtual Machine. Your XP Mode Virtual Machine is susceptible to viruses just like a real computer. To protect yourself from viruses and other forms of malware, you can stop Windows XP Mode from connecting to the Internet. XP Mode uses Microsoft’s Virtual Machine technology to run a fully licensed copy of Windows XP. This Virtual Machine borrows and uses your physical computer’s resources to fake Windows XP into thinking it is running on a real PC. Like any other resource, XP Mode also borrows your computer’s Internet connection. If you are like most people, you use various software (virus scanner, firewall, Microsoft Defender, etc.) and hardware (router, firewall, etc.) to protect your PC when you are connected to the Internet. Since your XP Mode Virtual Machine is capable of connecting to the Internet, you have to maintain these protections just as if it were a real PC. If you rarely connect to the web while in XP Mode, you are better off disabling the Virtual Machine’s ability to connect to the Internet. This way, you can avoid the hassle and expense of maintaining protection for the Virtual Machine. In fact, if your XP Mode Machine cannot connect to the web, there is little danger at all of contracting a virus while using XP Mode. Click on Start>All Programs>Windows Virtual PC to open the Virtual Machine window. Right click on the Virtual Machine and select Settings from the menu. In the Windows XP Mode – Windows Virtual PC Settings window, note that in the left hand pane, there are a number of settings you can change. 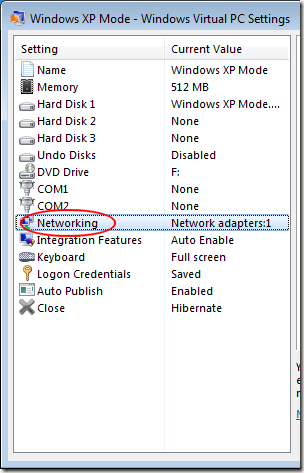 Locate the setting labeled Networking and click on it. 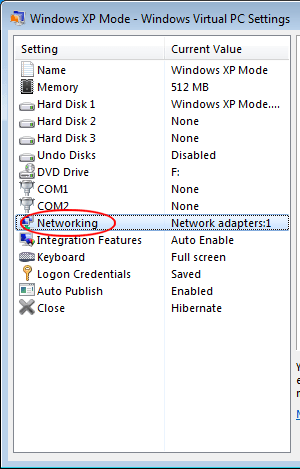 Note that the right hand side of the window changes to show you the networking settings for your XP Mode Virtual Machine. If you are like most people, you have only one adapter listed for Number of Network Adapters. For the setting labeled Adapter 1, use the drop-down menu to choose Not Connected. Using this settings, XP Mode no longer recognizes that there is a connection to the Internet available through your physical PC. 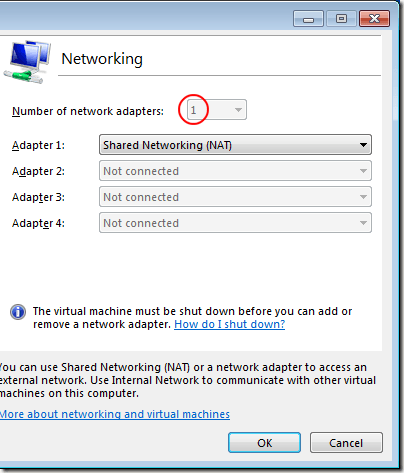 If you have more than one network adapter in your PC, make the same change for all adapters. Click the OK button and you are done. One of the problems of running an XP Mode Virtual Machine is that you have to maintain it similarly to a physical PC. This includes maintaining protection from viruses and other malware that you can accidentally download from the web. 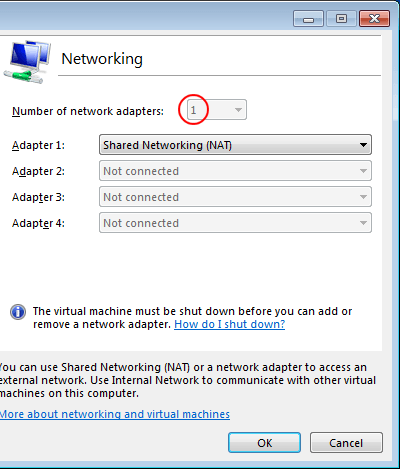 By setting the network adapters for the Virtual Machine to Not Connected, you can stop XP Mode from connecting to the Internet and virtually eliminate this threat.